When it comes to women’s plus size fashion, nothing flatters more than well-fitting dresses do. Whether it’s a short-sleeve midi dress with a button-front design or a loose-fitting wrap dress with kimono sleeves, dresses emphasise your assets while flattering your figure. Maxi dresses in floral prints will keep you cheerful and cool throughout summer whereas delicately detailed wrap dresses make the transition from casual to evening wear with ease. Bear black and white dresses for sophisticated and sleek work wear, reserving colourful prints and patterns for fun and festive flairs. For stylish shirts that will take you from a day in the office to an outing with friends, take advantage of our on-trend range of women’s plus size tops. Choose from camis, singlets and t-shirts in an array of different colours for an easy-going everyday look, turning to structured shirts and button-up blouses for office attire that’s attractive and appropriate. For everyday items that will complete your look, peruse our ranges of women’s plus size skirts, shorts and jeans. Stylish skirts and shorts make shopping for summer attire a breeze while form-fitting jeans and jeggings will be staples in your winter wardrobe. 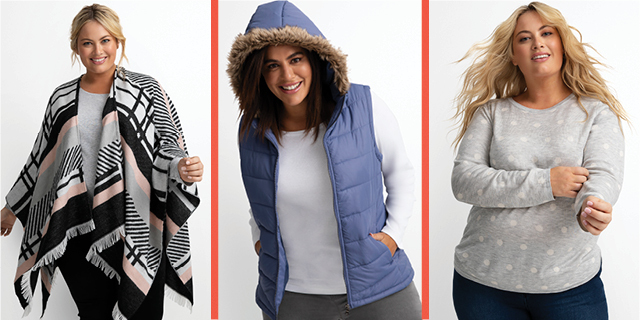 When the weather takes a turn for the worst, get wrapped up in our range of women’s plus size jackets and knitwear. Cardigans and sweaters made of soft touch yarn are perfect for light layering in the office, with monochrome tones and colours making it easy to mix and match. For relaxing days lounging around the house, take advantage of our range of women’s plus size jumpers. Roll-neck collars and zip-through features lend to snug fits and added warmth whereas bright colours and bold patterns will add an air of excitement to any outfit. For alluring lingerie that will leave you confident and contented, peruse our flattering collection of women’s plus size lingerie. Complete with underwire, adjustable straps and light padding for support, our edit of full-figure bras is as comfortable as it is complementary. Choose from cream, pink and white tones for interchangeable everyday wear, utilising bold black and red bras for a more memorable look. Finish off your attire with our edit of full-figure underwear, or instead opt for a complete ensemble with our offering of plus size lingerie sets and chemises. Whether it’s winter or summer, be sure to sleep right through the night with our range of women’s plus size pyjamas and sleepwear. Satin sleepwear sets and nighties in long and short-sleeve styles ensure a cool nights sleep in warmer weather, whereas tops and pants made of soft fleece fabrics provide comfort and warmth to help fall asleep during winter. Turn to solid colours for an understated edge or fun screen prints and patterns for a flair of festivity. Get set for the summertime with our stylish and affordable assortment of women’s plus size swimwear. For a retro and elegant look opt for one pieces with moulded cups and lining, reserving rash vests, board shorts and cover ups for light layering or practical purpose. For full-figure fashion made with support and style in mind, shop online at Best&Less. With a wide variety of plus size clothing to suit women of all shapes, sizes and styles and essential accessories fit to complete any outfit, you can’t go wrong with Best&Less.